It's been a long "last mile" to complete restoration. After plummeting from 13.8 million megawatt-hours in 2017 to 0.3 million megawatt-hours the month after Hurricane Maria, Puerto Rico’s electricity sales are now approaching typical levels. 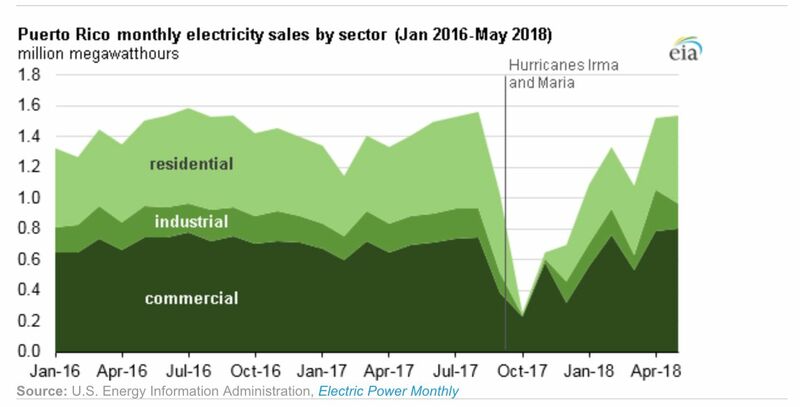 Energy Information Administration (EIA) data shows that industrial and commercial electricity sales are back to pre-Maria norms, while residential rates are still somewhat lagging. On Friday, the island’s electric authority reported that 104 customers remain without service. The outages caused by Hurricanes Maria and Irma have now continued for over 10 months, constituting the longest blackout in U.S. history. According to the EIA, in October 2017 residential electricity sales dropped to 3 percent of the previous October’s total. Industrial sales were only slightly higher at 6 percent, and commercial sales continued at about a third of last year’s levels. EIA attributes that balance to the prioritization of critical load centers like hospitals and community centers. The research organization began reporting data on Puerto Rico’s power plants in July. Puerto Rico’s electric authority reported last week that just 0.1 percent of customers remain without service, even as progress continues to see setbacks. 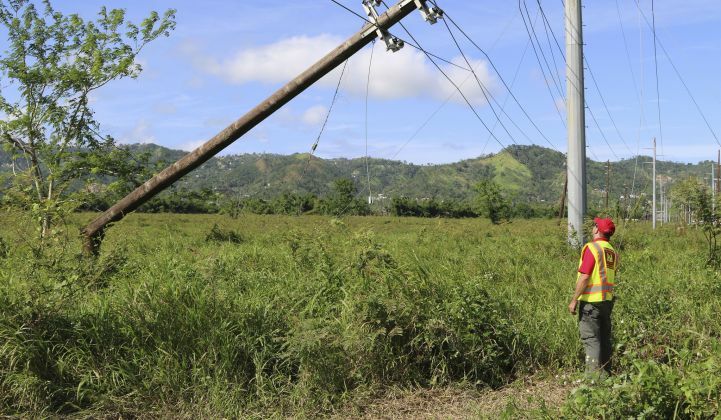 On Saturday, the electric authority announced that lineworkers had finished repairs on one line that faulted earlier in the week and knocked out service to some of the island’s eastern areas. Data from immediately after Hurricanes Irma and Maria shows that Irma caused more than 800,000 outages. 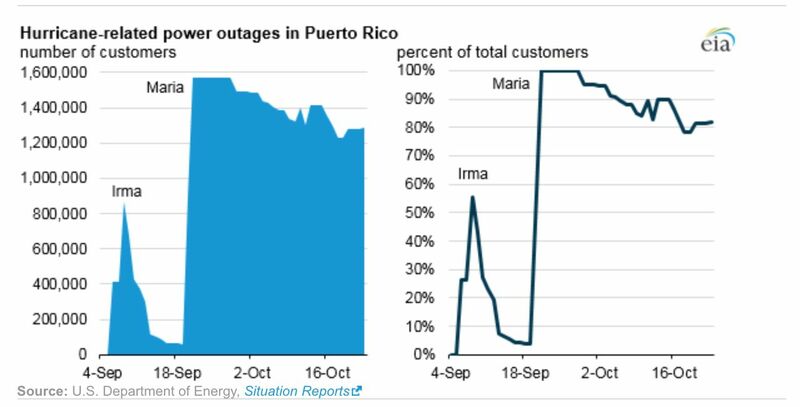 Though most customers who lost power at that time had it restored by mid-September, the arrival of Maria later that month drove outages up again, encompassing 100 percent of customers. By the end of October over 80 percent of customers were still without service. Authorities working in Puerto Rico have said the island has been working on the “last mile” of restorations since at least December. The plodding process has compelled some customers to looked to other fixes, such as off-grid systems. As the island’s utility, the Puerto Rico Electric Power Authority (PREPA), moves forward with the last restorations, it's also prepping for privatization. In an interview with Bloomberg, the utility’s new CEO, José Ortiz, said he expects that process to be complete in two years. PREPA will likely sell its generation assets and contract out the management of its transmission and distribution. PREPA officials met with federal lawmakers and members of the executive branch last week in the interest of presenting the utility’s new leadership and its plans for the future. In a statement on the meetings, the Puerto Rican government said Ortiz focused on the governor’s target of 40 percent renewable generation in the next five years. But Ortiz also highlighted a role for natural gas. Rep. Rob Bishop, who, as chair of the House Committee on Natural Resources, hosted a hearing on PREPA’s management in July, has also said he wants to increase the natural-gas footprint on the island. 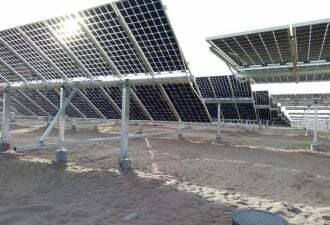 At the hearing, Puerto Rican Senator Eduardo Bhatia said the island should follow examples from states like Hawaii and California to incorporate more renewables. June legislation gave lawmakers in Puerto Rico 180 days to develop energy policies for the island that could guide privatization and possibly lay out goals for clean energy. Bhatia hopes a collaborative process will tie together the goals of the governor, the legislature, and the federal government, which have been disparate at times.